Following the Crimes Against Critical Infrastructure Bill, which threatens 1st Amendment and property-owners’ rights, through the winding halls of the Wyoming Legislature. Legislation drafted by a consortium of the most powerful fossil fuel industries and corporate interests in the country has been introduced, passed, defeated, or is pending in over a dozen states. The legislation, typically titled Crimes Against Critical Infrastructure and initially drafted by the American Legislative Exchange Council—or “ALEC”—is popping up in states where oil and gas pipelines and infrastructure are prevalent. In Wyoming, the legislation was brought to legislators for introduction by the Holland and Hart law firm, which represents the oil and gas and mining industries. 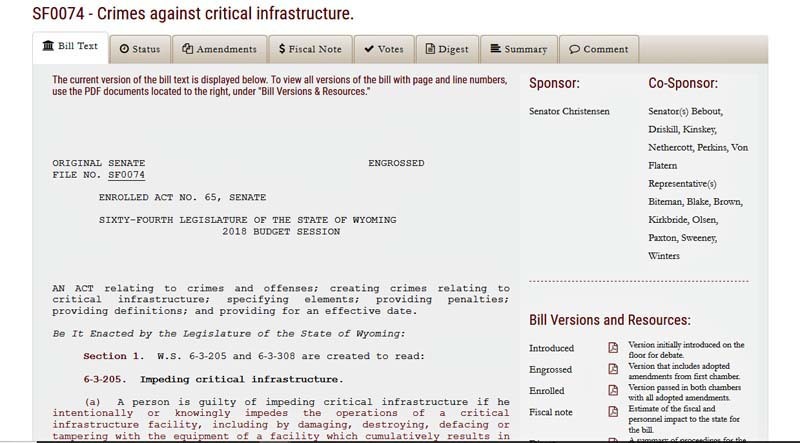 The Wyoming version of the bill, known as Senate File 74 – Crimes Against Critical Infrastructure, would make objecting to, protesting or “impeding” any critical infrastructure (such as pipelines, oil and gas wells and infrastructure, coal mines, refineries, trains, chemical plants, powerlines, and communications infrastructure) punishable by huge fines and imprisonment. Individuals impeding critical infrastructure would face misdemeanor and felony trespass charges, steep fines, and imprisonment for up to ten years. In Wyoming, the legislation was aimed at weakening First Amendment rights, and allowed fines of $1 million for organizations who “aid and abet” citizens exercising their right to free speech and association regarding virtually any form of energy-related proposal or project (think Powder River). A parade of companies representing every major corporate industry in the state supported the legislation. The Senate Judiciary Committee, in an unprecedented move, even allowed the bill to be introduced to the Senate Judiciary Committee by the director of the Wyoming Business Alliance. Opposition to SF 74, based on the fact that the bill contained vague and subjective language with numerous unintended consequences, was formidable and passionate. SF 74 quickly became the most controversial—and long-debated—bill of the session. One after another, landowners, church groups, Native Americans, the ACLU, and ordinary Wyoming citizens described all the ways this legislation could impact their free speech and private property rights. The unique combination of individuals and public interest groups gave corporate industry a run for their money and the bill was defeated twice during the session—it became known as the Zombie Bill. Powder River and our leaders and landowner members, Joyce Evans and Liza Millett, played a leading role in defeating the legislation in House Minerals, on a tie vote. Evans and Millett presented specific examples and concrete testimony about the far-reaching and unintended consequences of this legislation and how it could violate private property rights, hinder ranchers’ operations, and organizations. Unfortunately, the death of SF 74 did not last long because powerful industry lobbyists swarmed House Mineral Committee members after the vote and were able to resurrect the bill through unusual legislative procedural maneuvers. But Powder River continued to engage citizens across Wyoming to write and call in. After hours of floor debate in the House and 20 proposed amendments (12 of them passing), the session was coming to an end, and the legislation looked nothing like the original bill. By this time Big Industry was sweating because they had paid a lot of money to lobbyists to get the bill passed. Despite many legislators declaring the amended bill undecipherable, it passed by a narrow margin in the House. In the last day of the session, the Senate concurred with the House amendments, and the bill was sent to the Governor. Powder River urged Governor Mead to veto the legislation. Once again our chair, Joyce Evans, and member, Liza Millett, came to the rescue and met for over 45 minutes with Governor Mead, raising the same property rights and landowner concerns we had raised throughout the debate. Governor Mead vetoed the legislation later that day, saying it was imprecisely drafted and should be reworked in the interim. The rollercoaster ride over SF 74 is finished for now, but the fight over this legislation will likely appear next session. We will remain vigilant to protect landowner rights and our rights to free speech and association. Stay tuned and Stand with Us! By: Jill Morrison, Powder River Staff. Reprinted from the Powder River Breaks. Receive notice of new blog posts by signing up here.